The amulet. Credit: The Temple Mount Sifting Project. 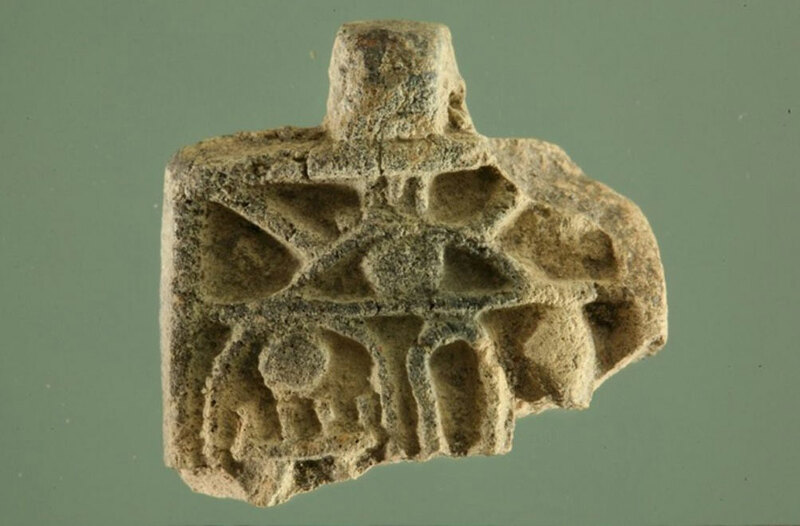 A rare amulet more than 3,200 years old bearing the name of the Egyptian ruler Tuthmose III, Pharaoh of the Eighteenth Dynasty (who reigned from 1479-1425 BC) has been discovered at the Temple Mount Sifting Project located in Jerusalem’s Tzurim Valley National Park within earth discarded from the Temple Mount. The project is conducted under the auspices of Bar-Ilan University, with the support of the City of David Foundation, the Israel Archaeology Foundation, and the Israel Nature and Parks Authority. Thutmose III was one of the most important pharaohs in Egypt’s New Kingdom and is credited with establishing the Egyptian imperial province in Canaan, conducting 17 military campaigns to Canaan and Syria and defeating a coalition of Canaanite kings at the city of Megiddo in 1457 BC. The amulet was discovered by Neshama Spielman, a twelve year-old girl from Jerusalem who came with her family to participate in the Temple Mount Sifting Project. “While I was sifting, I came across a piece of pottery that was different from others I had seen, and I immediately thought that maybe I had found something special,” said Spielman. “It’s amazing to find something thousands of years old from ancient Egypt all the way here in Jerusalem! Celebrating Passover this year is going to be extra meaningful to me.” The Passover festival, commemorating the Biblical account of the ancient Israelites Exodus from Egypt, will be celebrated later this week. Since the project’s inception in 2004, more than 170,000 volunteers from Israel and around the world have taken part in the sifting, representing an unprecedented phenomenon in the realm of archaeological research. While Egyptian scarabs bearing the name of Thutmose III have previously been discovered in Jerusalem, this represents the first time his name has been found in Jerusalem adorning an amulet. Objects bearing the name of Thutmose III continued to be produced in Egypt long after the time of his reign, reflecting the significance and lasting impression of this king. The amulet can be reconstructed based upon the discovery of an identical pendant found in Nahal Iron in northern Israel, announced in 1978. Along with that pendant, which also bore the name of Thutmose III was another amulet bearing the name of King Seti I, an Egyptian pharaoh who ruled Egypt during the late 14th – early 13th centuries BC. This seems to indicate that both pendants date to the same time period, namely the late 14th – early 13th century BC. The amulet may have been buried in earth brought to the Temple Mount to be used as fill for the expansion of the Mount in Second Temple period. This earth probably originated in the slopes of the Kidron Valley near the Temple Mount, an area which contained tombs of the Late Bronze Age (1550-1150 B.C). Pottery sherds dated to this period were discovered in the Temple Mount Sifting Project, including some imported from Cyprus and Mycenaean Greece, as well as a couple of Egyptian style scarabs’. These artifacts can be added to other finds dated to the Late Bronze Age (1550-1880 BC) discovered in past years in the City of David as well as artifacts hinting to the possible existence of an Egyptian temple, in the Dominican monastery of St. Étienne north of the Damascus Gate. Since the Temple Mount has never been excavated, the ancient artifacts retrieved in the Sifting Project provide valuable and previously inaccessible information. The many categories of finds are among the largest and most varied ever found in Jerusalem. Even though they have been extracted from their archaeological context, most of these artifacts can be identified and dated by comparing them with those found at other sites.